In addition, an updated Instructions document has been created with removal guidance as well as some information on how to manually remove everything configured by the add-in in the unlikely event (something that has not been encountered yet) that the add-in and it's configuration cannot be removed using the suggested method. some became worried about the stability of my add-in and what it could do to their system. I want to make clear that as yet I have received no reports of data loss, reduction of system stability or performance, famine, flood or death as a result of the use of this add-in. Despite that, this add-in still relies on a number of unsupported Windows Home Server sub-systems (but supported portions of the Windows Small Business Server which serves as the basis for WHS) and simply exists as a warning of that. At a later date I will replace the current warning with a less intrusive one. Any users using the initial release of this add-in are advised to uninstall the previous version, download the new one and install it. You are NOT required to remove the previous configuration prior to this upgrade. Note that Software Update for Web Folders (KB907306) is still required on client machines if not already installed. Bloody lovely! This should be provided by default with WHS, but you've definitely taken the initiative here by doing this! I installed this last night on my HP Mediaserver and it worked great. However today while at work I am trying to connect via the "normal" web interface I get a pop-up login dialog box asking for my username and PW. After entering them (normal usernames or administrator and PW's)I get the following error. As a note I never installed the client patch at work as I assumed it was just for the mapping of drives etc (and it's a work machine I dont want to put additional sw on). Is that required for any machine to connect in any fashion after this is installed? Thanks for your help! The patch doesn't really have anything to do with mapping a drive (ie z:\), instead it is required for WebDav over HTTPS when you open the WebFoldersShare dir on your server as a web folder... without the patch (or with it but when accessed over ordinary HTTP) you should get a file list in your web browser. What happens if you try to open up the URL (and log in appropriately) in your browser without opening it as a web folder? For a faster response, drop me an email and we can try to work through this. This is a MUST-HAVE add-in for anybody that accesses their WHS remotely. My congratulations to Brendan for this one. 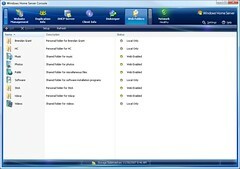 I have mapped drive in Vista but I do not see any shared folders and I cannot copy any files. Simply installing the add-in and mapping the drive isn’t enough, in order to make the shares remotely available you need to expose them through the main view of the Web Folders tab in the Home Server Console. Thank you very much for this! I am now able to backup files from the office to the server very easily rather than having to try and do it one-by-one via the built-in uploader. Worked like a charm! I also receive a 401.2 error, when using IE to open my webfolders. When I try to list the content of a non-user share I get the 401.2. I can list the content of an user-share, but no subdirs or files in those folders. I have just come across your Add-in. 1) I take it that WHS itself has to be enabled for remote access overall for the Web Folders to work remotely? 2)If a user opens a file (Word document) from the Web folder, can he/she work on it directly and save back into the folder. Or does the file have to be dragged and dropped into the local computer? Has anyone used this succesfully with the 7pass Windows Phone app? 7pass is a KeePass 2.x database (*.kdbx) reader for Windows Phone 7. Has anyone tried installing this on Windows 7 Home pls or have any idea whether it'd work? Can you bring it for WHS 2011 please?